Located just five minutes from Banff National Park and fifteen minutes from the Banff townsite on the edge of Kananaskis Country, the Town of Canmore is an ideal staging point for a Canadian Rockies vacation. However, because of Canmore’s close proximity to the Rocky Mountain national parks, advance reservations are strongly recommended for the summer season, for all national and international holidays, and for the ski season. 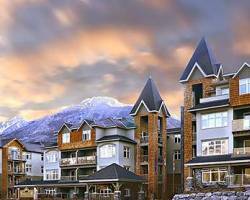 The Windtower Lodge is nestled right in the heart of the Canadian Rockies in beautiful Canmore. The centrally located lodge is beautifully decorated and boasts mountain views that are second to none. As well as bringing high quality service and rooms to visitors, the Windtower offers long term accommodation for those who want to spend that big longer. Included are indoor heated parking, outdoor hot tub, fitness centre and the small things like a daily newspaper delivered to your door.